Throughout my years of cooking, I would have to say that one of the most basic tools you would need in your kitchen is a great potato masher. Whether you’re making good old mashed potatoes or something more sophisticated like a Shepherd’s Pie, the key is having the perfect masher. I have had one or two instances where I did not get the result I wanted simply because the masher I had was just not the right quality. Most of the time I would often still have lumps of potatoes despite endlessly trying to mash it but after finally using great mashers, I finally saw that it was both easy and quick. 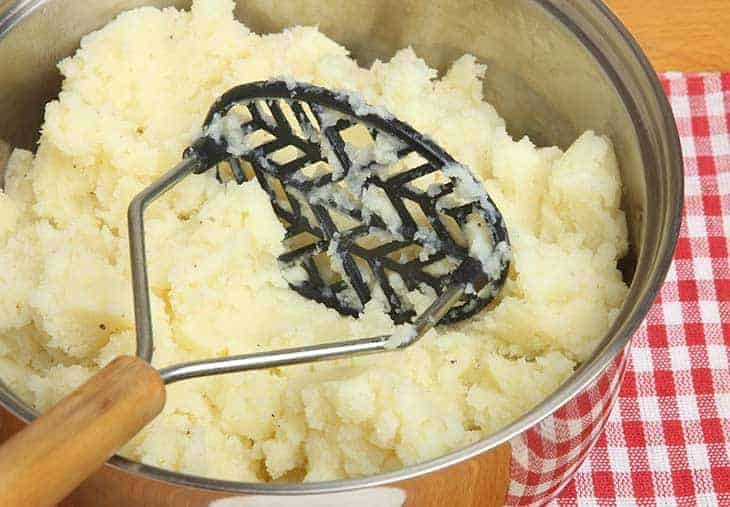 Since no one wants lumps in their mashed potatoes, I have listed the best potato mashers in the market as well as some tips and tricks that have helped through the years. If you’re tired of those uncomfortable vertical grips then, this Kukpo potato masher is your new best friend. The horizontal handle makes it more comfortable to use and also more efficient. This horizontal grip also allows you to give maximum pressure to your mashed potatoes without overworking it. Aside from this, it also has a wide mashing plate so your potatoes won’t be slipping off anymore. It has a durable body and is made of stainless steel so it’s great for daily use. Its horizontal handle makes it more comfortable and easier to use compared to other mashers. It is easy to clean for less hassle in the kitchen. The wide mashing plate and short handle allow fewer potatoes to slip off while you’re mashing it. After numerous uses, the edges of the masher does bend. You can put it back in place easily but can be a huge headache if it happens too often. The handle comes off quite easily but it’s easy to snap back. Looking for something versatile? 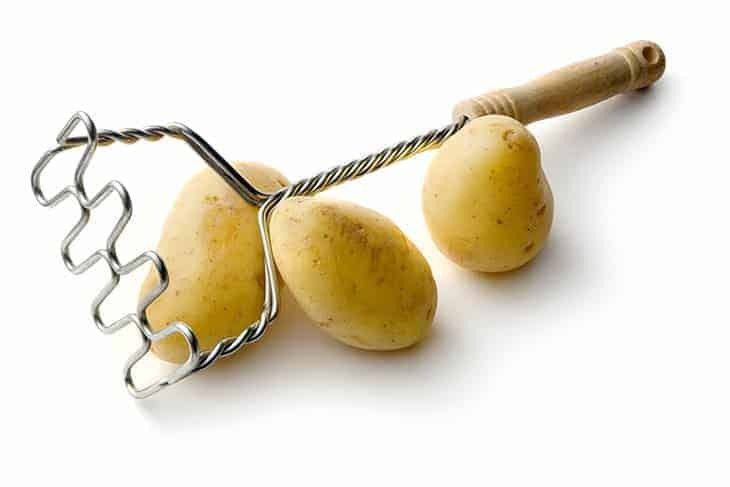 Then, this OXO potato masher might just be what you are looking for. It can mash other root crops and vegetables with no trouble at all so you can have a feast using just one tool. The handle is a vertical handle so it can be slightly uncomfortable but the cushion grip does help in lessening the pressure. It is multi-functional, so you won’t just be mashing potatoes with this but instead, you’ll be mashing more vegetables than you can imagine. The cushioned grip makes mashing more comfortable so you won’t have those red marks on your hands. It is dishwasher safe so you can just pop it in your dishwasher and you’re good to go. It has a hole at the end of the grip for easy storage. The vertical handle can be a bit uncomfortable with prolonged use. The waves are a bit thick so sometimes potatoes slip off. Food particles easily get caught up in between the waves making cleaning a bit challenging. This potato masher is really unique and instantly caught my eye when I saw it. The design makes it possible for you to mash your potatoes and mix your mashed potatoes with just one tool. It can mash almost all root crop and vegetable you can think of and the whisk-like design makes scraping mash from the side of bowls easy. This is made of stainless steel that is food grade so it is 100% safe for you and your family. It is a 2-in-1 device that allows you to mash your potatoes and mix them at the same time so you won’t need to buy another tool. It is versatile and can mash other types of vegetables. It is made of durable material and FDA approved stainless steel so you and your loved ones are always safe. It does not have a rubber grip making it uncomfortable to use for long period of time. Food and starch get stuck to the waves. To avoid this, it’s best to rinse it immediately after using it before the starch dries up. 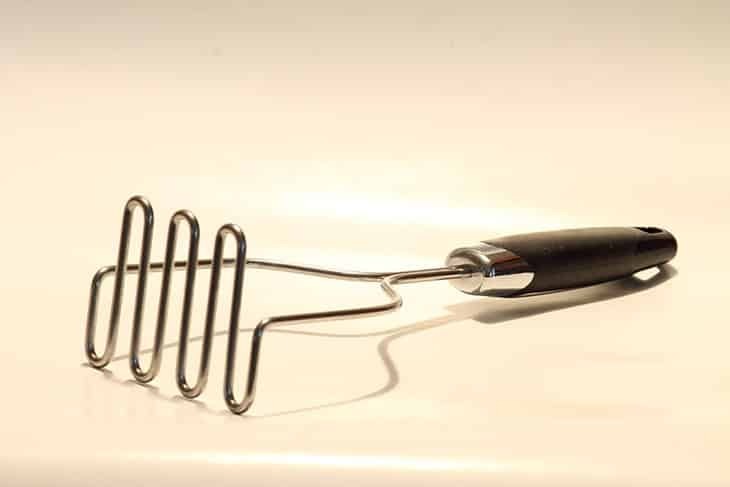 This Zyliss potato masher is a great addition to anyone’s kitchen. It is made of quality materials and also has a 2-in- design which allows you to scrape off the mash from the side of the bowl to avoid wasting food. The silicon side makes it more flexible and allows you to scrape more food. It has smaller inner holes and larger outer holes to avoid getting lumps in your mashed potato. The variation in the holes gives smoother and fluffier mashed potatoes. It is dishwasher safe which is great news for those who are always on the go. It has a hole at the end of the handle for easy storage. It’s slightly more expensive than most of the mashers on this list. If you are planning on storing it in your drawer instead of hanging it, be prepared to give up a lot of space for this because it is big and takes up a lot of space. The handle is a bit too big for my hands so it was a bit hard for me to grip it. 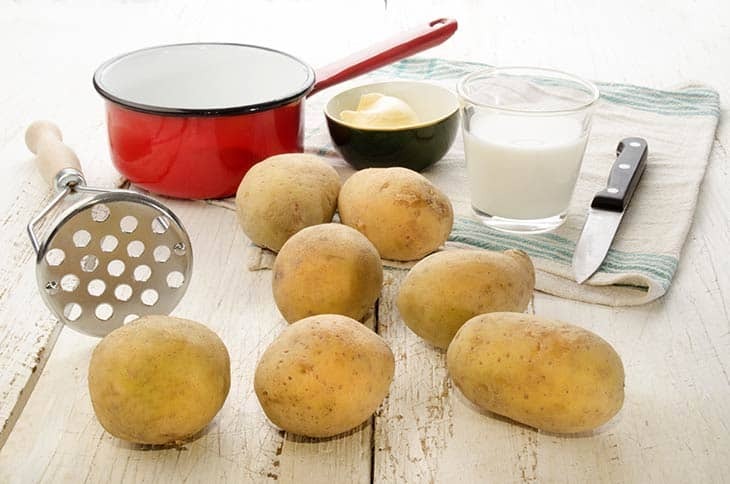 This perforated potato masher from Precision Kitchenware is an ideal choice for those who want fluffy mashed potatoes. The holes are small and give you smooth mashed potatoes. It also has a non-slip rubber grip so you won’t have to worry about it slipping off your fingers. It is a perforated potato masher so it gives smooth mashed potatoes every time. It has a non-slip handle so I never got red marks on my hands while I was using it. It is easy to clean and also dishwasher safe. The handle can get uncomfortable after prolonged use. There aren’t a lot of holes so if you want to mash other vegetables you might need to mash for a longer period of time. 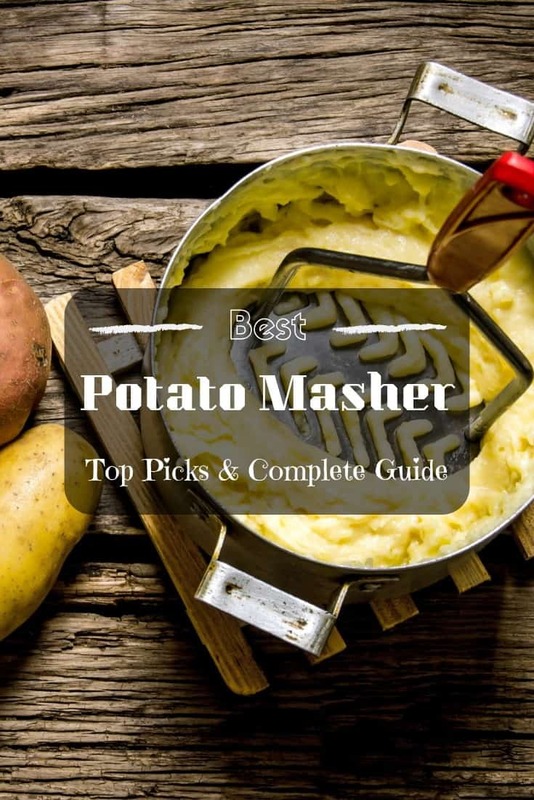 Best #potato masher: Top picks and a complete guide! What is your favorite #kitchen gadget? Not all mashers are created equally and so you have to look closely at what each masher offers. Knowing what to look for in a great masher is ideal for you to get the masher you really need and for you to be a smart buyer. With any tool, you mostly have it so you can have an easier life. This means that your masher should not cause you any discomfort while you are using it. The best way to know if the masher is ergonomically designed is if it has a rubber handle, this would allow you to have a better grip on the masher. A ridged surface would also be a great feature. These two helps you to comfortably hold your masher and not get those red marks that you sometimes get while using it. Making sure that your masher is ergonomically designed does not only assure your comfort while using it, it also means that it will be safe to use and that it won’t suddenly slip off your fingers. The rubber grip and the ridges also help with keeping your masher in your hand and not flying off. 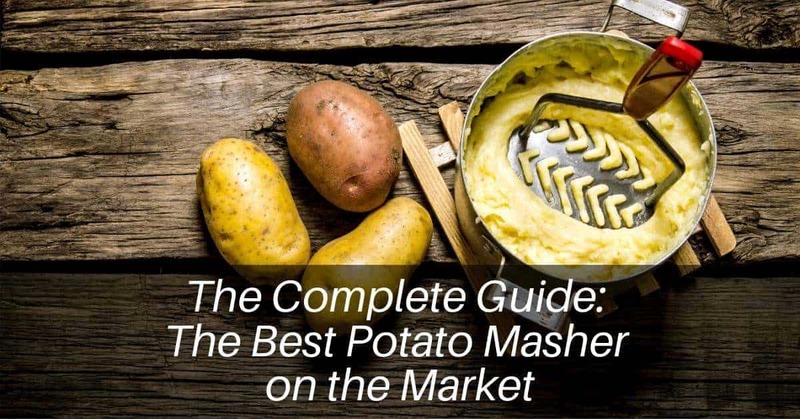 In general, there are two types of mashers and the type that you should get depends on how you want your potatoes to look like. The first type of masher is a perforated one. As the name suggests, it has small holes on it that mash your potatoes to that fluffy goodness. Since it is perforated, I have found that the mashed potatoes I get from this are similar to the ones that you would get with a ricer. They’re fluffy and rarely leaves any lumps. This is ideal for those who would be mashing bigger and harder potatoes since these are more heavy duty. The second type of masher is the waved one. These also get the job done but you might have a hard time if you are mashing potatoes which are bigger. You would also need to boil your potatoes a lot more with this if you want to get the same fluffy mashed potato you’d get from the perforated one. I would recommend this masher to those who like having a more textured mashed potatoes. Who would want a masher that breaks after just a couple of uses? No one, that’s who. So you should make sure that your masher is built to last. Yes, this is not an expensive item but if you keep on buying it then the cost would add up and it won’t be good news for budget conscious cooks like me. For me, being able to use a single tool for multiple needs is a true test of how great it is. The same goes for the potato masher. It’s not cost efficient if you can’t even use to it mash other types of food. Most potato mashers can mash other soft fruits and vegetables but getting a heavy duty one would also let you mash harder ones. With how fast paced our life is, no one would want a masher that would need years to clean. Getting one which doesn’t allow pieces of potatoes to get stuck in between the holes or the waves would be a blessing since you won’t have to scratch your head over how to clean those hard to reach areas. Getting a masher which is dishwasher safe is also a huge plus. Not having the right type of potato is like going into battle with the wrong bullet. This is a step that you should not neglect. 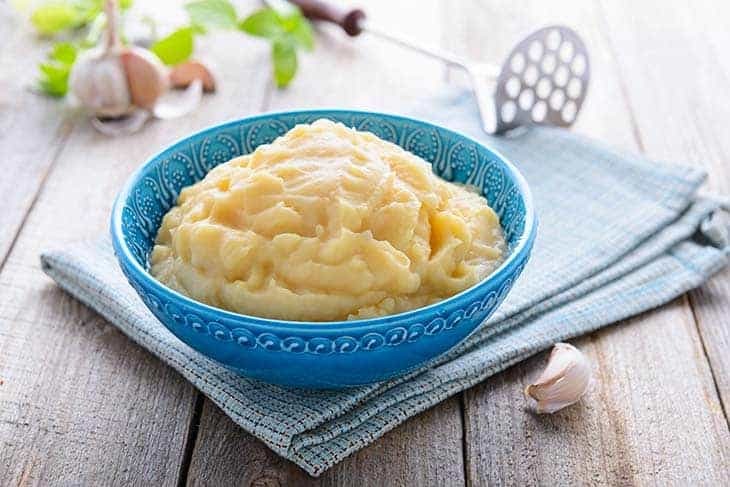 To get the best results I found that using Russet potatoes is best if you want to have fluffy and smooth mashed potatoes. If you want a more rustic one using red potatoes is the best. If you add cream and butter straight out of the fridge, your potatoes would not absorb them as well. Aside from this, you’ll also need to mix the cream and butter to the mixture a whole lot more making you more vulnerable to over-mixing your potatoes. For best results, it’s best if you allow your butter and cream to at least be room temperature first so it won’t cool down your dish and it’ll be incorporated to the mixture better. As you mix your potatoes, you are also releasing starch. When too much starch is released, you’ll end up having a mash that is gooey and not at all fluffy and smooth. The best way to not overwork your potatoes is by doing as minimal handling as possible. Also, stay clear from food ﻿﻿processors ﻿﻿and blenders. These do give you mashed potatoes faster but they are too aggressive and your potatoes would end up not as fluffy. After going through all these potato mashers, I would have to say that I highly recommend the Kukpo potato masher. It's horizontal handle really stole my heart. It's easier and more comfortable to use compared to all the mashers I have tried in the past. The fact that it is a perforated one is also a huge plus. It's also easy to clean and is very durable. 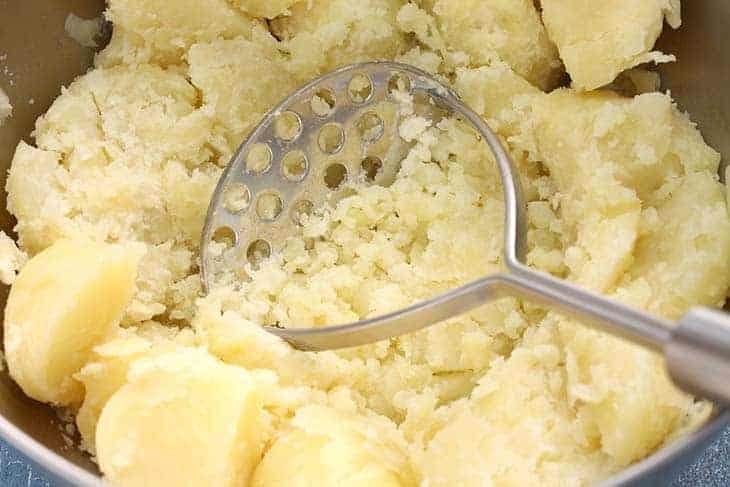 I hope that you found this article helpful in your quest for the best masher and ultimately getting the best potatoes. Did I leave something out in the tips section? Is your favorite masher not on the list? Comment down below so more of us can know your thoughts and suggestions. Are You Curious: What Does Eel Taste Like?